1) The force emitted by the contact of the cuspids at the moment of occlusion can reach up to 400 kg. 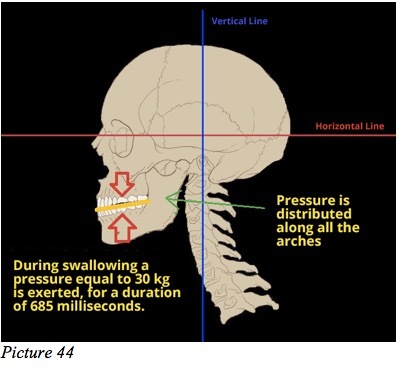 2) Every act of swallowing redistributes 1 kg of force along the entire spine. The force applied to the teeth during swallowing is about 30 kg, for the duration of around 685 milliseconds. In picture 44, the skull, with the Rectifier, redistributes the load in a uniform manner along all the dental arches. In picture 45, without dental height the pressure is exerted only in the incisor and canine area, thus the fulcrum is situated in this area. Picture 46 shows the decline of the skull as it was in picture 45. In fact in picture 46 it is visible just how much the skull has sunk, changing the direction of the gaze. 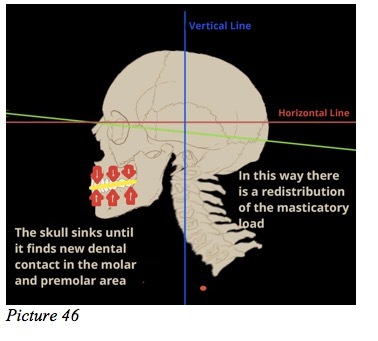 In picture 46, the skull, having sunk down, finds a new stable occlusion and there is a redistribution of the masticatory loads. It must be said that with every swallow the tongue pushes against the palate with a force of around 1 kg per square inch. 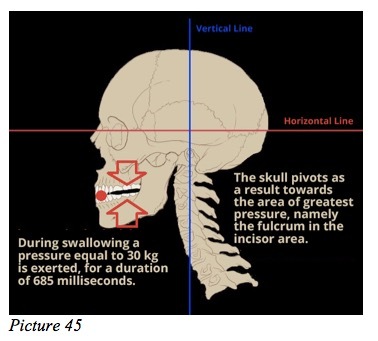 Considering that over 24 hours 1500-2000 acts of swallowing are carried out, it follows that throughout the day a force of 2000 kg is exerted along the entire oral cavity. This happens because the strongest muscle in our body, the masseter, does its work within the stomatognathic system. This information helps us to understand that these forces have their origin in the mouth and are transferred to the underlying structures, modifying them in turn. 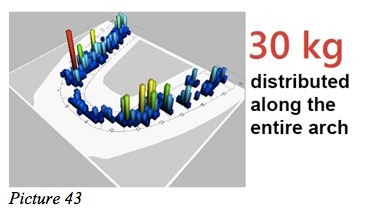 In the following chapters this phenomenon is explained in detail.